Many of you will have heard about the hit-and-run accident that I had at the end of January: riding down Leamington Spa High Street, a car parked on my side of the road (but facing towards me) pulled out into my line of traffic and hit me head on. The total impact speed must have been around 30 mph, and resulted in me laying on the road, front wheel buckled, bike in tatters, and the driver of the car nowhere in sight. The more I considered these questions, the more I started observing cyclists on my daily commute into uni; poor lights, black coats, black rucksacks, black bikes... the list goes on, but what it boils down to is that some cyclists don't help themselves. Well, my Wightlink-LCM team kit is pretty darn bright, but I decided that even I could do more to increase my visibility. So in this blog I take a look at three products that I have started using that will make your commute safer, and provide no chance of a SMIDSY excuse from drivers. Most of the time when I am commuting I use a trusty set of Ortlieb classic panniers, however on a short commute, or when you are just nipping across town to the shops these can be a bit of a hassle. Enter the role of the rucksack... but there is no point in wearing hi-vis clothing if you're then going to put a black rucksack on over the top of it; that's where the Proviz Nightrider comes in. Fully water resistant, the NightRider is made of Cordura and water repellent nylon; it uses waterproof zips and overlapped stitching to ensure that even in the worst downpour its contents stay dry. Trust me, I've taken this through a few big showers, and on a bike without mudguards/ and my kit has stayed as dry as it does in the Ortliebs (which is saying something). Inside, the Nightrider has got plenty of pockets to stash your kit; a few small ones for pens, a phone and tools etc. and then a good padded back pocket for a laptop. On the sides there are mesh pockets that are handy to put gloves, lights and other necessities in when you arrive at your destination, then on the front there is a big deep outside pocket that is perfect to stuff your damp coat in as you walk around the supermarket. The bag has got big comfortable straps and back padding, whilst using lightweight materials elsewhere, to keep the overall weight to a minimum. I have found it comfortable when not too loaded on a 8-10 mile commute. I think that if you are going to be piling in heavy equipment then panniers are clearly a better option, but if you just have a pair of shoes, and a change of clothes this pack is perfect. 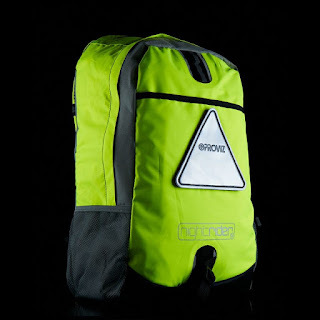 There are some clever little details to the design; such as the reflective strips on the shoulder straps to increase front visibility, the waterproof pocket on top that is big enough to fit a mobile and wallet in, and the chest strap for added stability. Overall it seems like a good, lightweight pack, that is comfortable for commuting. The Nightrider really comes into its own when you purchase the TriViz light as well though. 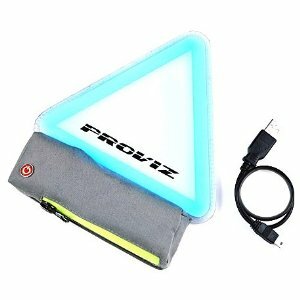 Take off the existing reflective triangle and put on the TriViz and the electric blue flashing really will show up well in the dark. The neat little waterproof battery pack charges via a USB in about 4 hours and will keep its charge for around 12 hours. This really is the shining star of this bag; making it far more visible that other HiViz packs I have seen. I'm thinking that I might try and find some heavy duty velcro so that I can use the TriViz on my panniers as well... it's that good. If you need a good hi-vis pack the Nightrider is a good option then; don't turn to it if you are planning on carrying a weekly shop, but for the daily commute you'll have a real job to find better at this price. Wearing fluorescent clothing may not be the height of fashion, but it is a sure-fire way of making yourself more visible to drivers. A cheap way of doing that is to wear a builders' hi-vis vest over the clothes that you are cycling in; but these are definitely not the coolest looking things, or the longest lasting. Recently I've been using the D1 Reflective Vest from Georgia in Dublin for my commute; it's a modern take on the hi-vis vest, with water resistant, wind-cheating properties. It is closer fitting than a builders' viz-vest as well, although I have a medium and think that I probably could have taken a small, as the sizing is still quite generous. It is also a fair bit funkier looking, with reflective panels and strips in an almost artistic pattern. The vest comes in two colour schemes; a dark green and florescent yellow combo, and the white and orange option that I have. I think that for increasing your visibility the white is a clearly more effective choice; but for those looking for something a little more discrete the camo green may be a good option. On the bike, the vest shows up very well; the reflective and coloured panels are tactically positioned to catch the eyes of drivers, and even if you have a rucksack on, the lower panels on the back are still visible and help to alert your presence to following drivers. The D1 Reflective Vest is a great turn to product; for when you need to jump on the bike and nip to the shops or into work, but you don't want to get dressed up in fluoro kit. It is waterproof and wind-proof, so it provides a fair bit of warmth as well; although I suspect it may get a little sweaty on summer commutes due to the nylon material. Overall, a great product for those that want to increase their visibility quickly, whilst looking arty in doing so. The D1 vest is not overly cheap at 40 euros, but it is a small price to pay for increased safety. This gilet is recommended for anyone that is riding in a fair bit of traffic or in low-light conditions. The Leggits are certainly a unique bit of kit; effectively calf-length overshoes/gaiters made of waterproof nylon, they are designed to keep your lower legs and shoes dry, clean and warm. In those three objectives they do admirably well; whilst taking a little while to get on, I have been very glad of their protection from the elements when the heavens have decided to open. The Leggits were originally brought out for the female market, and I'll be completely honest and say that they do look slightly feminine; the elasticated tops make them look a little frilly, and they do look a bit like you are wearing leg warmers. That is not a problem at all for the ladies, but it may deter a few of the macho cycling men out there. Having said that, I've been very grateful of the Leggits when I've used them, and they certainly do a stellar job of increasing your visibility in the bright yellow fluoro colour (they also come in black, grey and red). They look like two fluorescent batons spinning round at 90 rpm when you catch sight of them in a shop window as you cycle past. They are also very effective at keeping the bottom of your trousers clean and free of the chain, which is a big asset if you are jumping on the bike to nip across town. On the whole, I can't help but feel that the Leggits will still be a bigger hit with the female cyclists out there; but for everyone, they provide welcomed protection from road spray, and significantly increase the warmth in your lower body. They work well as a visibility device, and they are standing up to a good bit of abuse; well worth considering to keep your feet dry and your presence noted out on the road. I definitely need a Leggits for my cycling! Nice post! Thank you for sharing. Safety Clothing are designed keeping in mind the nature of work or usage. A worker working on machines may be required to wear tight fire proof clothing where as a bike rider may need Hi Vis clothing. Explore the web to find safety clothing scientifically designed to suit to your needs at cheap prices.